Taken on April 3, 2019, a Russian solder stands guard near a Pansyr-S1 air defense system on the Kotelny Island, part of the New Siberian Islands archipelago located between the Laptev Sea and the East Siberian Sea, Russia. WASHINGTON - At this year's International Arctic Forum in St. Petersburg, Russian leaders made the most peaceable statements to date about Moscow's long-term plans for the a rapidly melting Arctic. Answering questions during the forum's international plenary session, President Vladimir Putin extolled Moscow and Washington's common interests in the region, explaining that he doesn't sense any "special military tension" in the region. Not only does Russia forego military exercises in the Arctic, it's focused on helping neighbors dramatically increase cargo shipments across Arctic sea routes, he explained. "Our aviation activity in the Baltic Sea zone, the Arctic, is an order of magnitude lower than the activity of the NATO countries," he announced to those in attendance, which included the leaders of Finland, Iceland, Norway and Sweden. "This is a realistic, well-calculated and concrete task. We need to make the Northern sea route safe and commercially feasible," Putin added. But Putin's account of an ambitious commercial program to secure an Arctic foothold, which includes the planned construction of ports, infrastructure and even an expanded fleet of icebreakers, omitted the following activities. 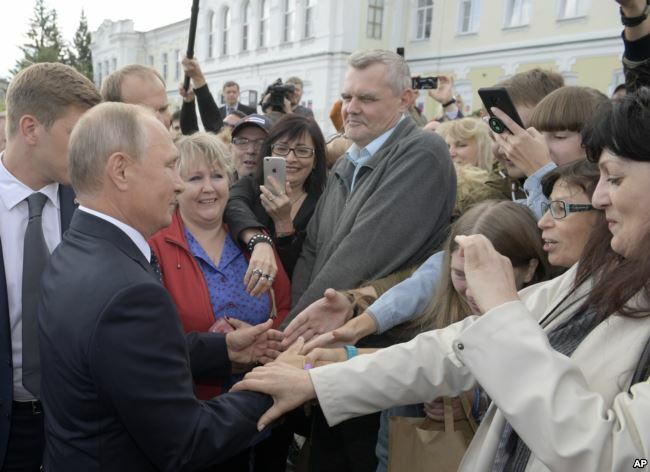 FILE - Russian President Vladimir Putin, left, greets local citizens in Omsk, Russia, Aug. 28, 2018. May 2017: At Moscow's annual Victory Day parade, Russia unveils new weapons system with missiles outfitted for use in the Arctic. February 2018: Admiral Nikolai Yevmenov, commander of the Northern Fleet, declares the strengthening of Russia's Arctic military presence with the placement of tactical unit outposts. 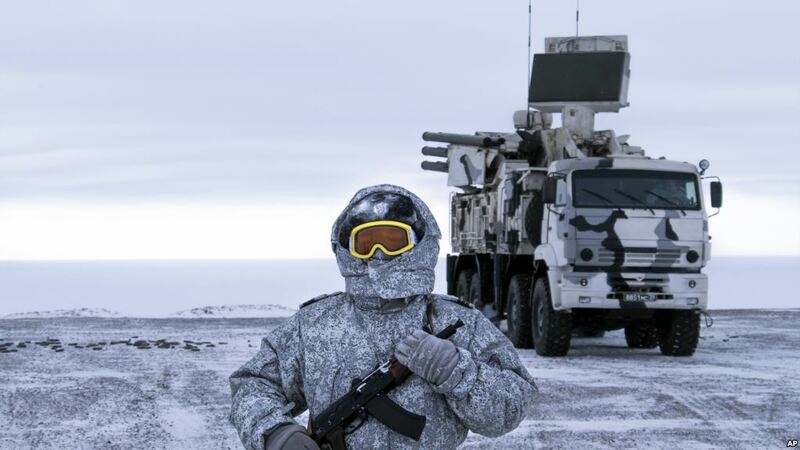 "This is an Arctic-motorized rifle brigade, a tactical group of coastal troops, air defense units that maintain a watch on the islands of the Arctic Ocean, in the archipelagoes of Franz Josef Land, Novaya Zemlya, Severnaya Zemlya and the New Siberian Islands." March 2018: "Putin," a newly released campaign-trail film, shows the president boasting of Arctic-based, state-of-the-art missile-launch detection and tracking systems. "The Arctic region is extremely important for Russia," Putin is recorded saying, and that U.S. submarines "keep constant watch in the Norwegian Sea off the coast of Norway." April 2018: Rosgvardia, Russia's National Guard, conducts transport and assault exercises on the militarily inhabited Franz Josef Land. September 2018: Colonel General Oleg Salyukov, commander of the Russia's ground forces, announces a new generation "Tor-M2" air-defense missile system for use in the Arctic, and he says that the Bastion-P mobile anti-ship and surface-to-surface missile defense systems have already been placed on Kotelny Island. Some U.S. military officials and legislators have expressed concern that Washington isn't paying enough attention to Russia's military entrenchment in the region. In August 2018, Congress passed a National Defense Authorization Act that approved unprecedented funds for the construction of six new polar class icebreakers by 2029. The U.S. Coast Guard has only two -- one of which is 10 years beyond its intended use -- compared to Russia's 46.